Most Beautiful Canals of Amsterdam - These are the Must See Canals! What are the most beautiful Amsterdam canals? So, you’re visiting Amsterdam and wondering what canals are definitely worth a visit. Ask ten people about the most beautiful canal and you will get ten different answers. Then who should you trust? 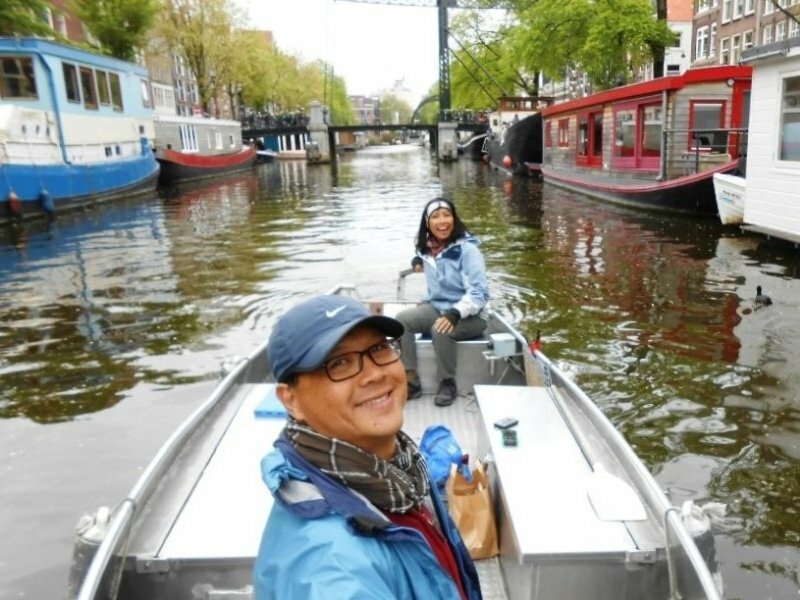 How about a guy that’s been living in Amsterdam since more than 25 years and operating his own Amsterdam boat rental company for more then 10 years? Indeed, that guy is me. And I’m sure you will like my personal list of most beautiful Amsterdam canals. Are you ready? Here we go! Many Amsterdam locals will agree that the Brouwersgracht is the most beautiful canal of Amsterdam. In 2007, when local newspaper ‘Het Parool’ asked its readers to vote for the most beautiful street of Amsterdam, Brouwersgracht actually ended top of the list. What is it that makes Brouwersgracht such a beautiful canal? * the wide and picturesque views at the intersections with the four main canals. All that ain’t bad for a former ‘industrial area’, right? Because that’s what Brouwersgracht (literally translated: Brewery Canal) was in the old days: a canal full of beer breweries. Many of the warehouses that you still find on Brouwersgracht were used to store the grains. We’re talking late 16th century, when regular water was too polluted to drink. So believe it or not: beer was always the best drink to go for. Nowadays, Brouwersgracht belongs to the most popular residential areas in town. The prices of real estate have skyrocketed over the last couple of years. This includes the house boats, of which many are for rent on Airbnb and other holiday home portals. In between all residential apartments are some specialty shops, small scale offices, and a couple of iconic cafes. They include all time local favourites such as café Thijssen (on the corner of Brouwersgracht and Lindengracht) and café Papeneiland (since 1642, on the corner of Brouwersgracht and Prinsengracht). Moreover, Brouwersgracht combines beauty with function. It connects the four main canals in town (Singel, Herengracht, Keizersgracht and Prinsengracht) and it is one of the main arteries for boats heading into Amsterdam’s Wild Wild West. Surprisingly, despite its attractiveness and its function as a corridor, the more western part of Brouwersgracht (west of the intersection with Prinsengracht) is still relatively quiet. Thankfully, Brouwersgracht is pretty much impossible to miss on your Amsterdam canal tour. It is no more than 10 minutes boating from our boat hire. Since all good things come in twos, we actually recommend to see Brouwersgracht twice: one way at the beginning of your trip and the other way at the end of it. Many Amsterdam locals will agree: Brouwersgracht is the most beautiful canal of Amsterdam. When local newspaper ‘Het Parool’ asked its readers to vote for the most beautiful street of Amsterdam, Brouwersgracht also ended top of the list. What is it that makes Brouwersgracht such a beautiful canal? It’s probably the combination of beautifully preserved houses, many attractive house boats, rather small streets, majestic trees, nice bridges and the picturesque views at the intersections with the other canals. Not bad for a former ‘industrial area’, is it? That’s what Brouwersgracht (‘Brewery Canal’) was in the old days: a nest of beer breweries. Many of the warehouses were used to store the grains. We’re talking late 16th century, when regular water was very polluted. So beer was always the best drink to go for! In between all residential apartments are specialty shops, small scale offices, and some iconic cafes. They include all time local favourites like café Thijssen (on the corner with Lindengracht) and café Papeneiland (since 1642, on the corner of Prinsengracht). Moreover, Brouwersgracht combines beauty with function. It connects the four main canals in town. And it is one of the main arteries into Amsterdam’s Wild Wild West. Surprisingly, the more western part of Brouwersgracht (west of Prinsengracht) is still relatively quiet. Thankfully, Brouwersgracht is nearly impossible to miss on your canal tour. It is less than 10 minutes by boat from our boat hire. We recommend to see Brouwersgracht twice: one way at the beginning of your trip and the other way at the end of it. If we were to make a list of the most popular or the famous canals in Amsterdam, without any doubt Prinsengracht would rank number 1. I guess that 99% of all Amsterdam visitors get to see Prinsengracht, one way or the other. And so should you! With its impressive length of more than 3 kilometers it cuts right through the city center, starting in the northwest at Brouwersgracht and ending in the Amstel river. One could argue that the extensions Korte (meaning ‘short’) Prinsengracht to the north and Nieuwe (meaning ‘new’) Prinsengracht to the east are also part of Prinsengracht, making it even more omnipresent. The construction of Prinsengracht started in1612 and took almost 50 years to complete. In that period Amsterdam became the third largest city in the world, after London and Paris. Can you imagine? After all this time Prinsengracht is still bustling with life, mainly due to a perfect blend of different functions. Prinsengracht is a thriving village in itself: there are residential apartments, hotels, offices, shops, galleries, cafes, restaurants, churches, coffee shops, museums and so on. Among these are two Amsterdam icons: the Westerkerk (church) and Anne Frank’s House. The magnificent Westerkerk is a 17th century protestant church in renaissance style. Its 87 meter tower is a true Amsterdam landmark and contains a lot of ‘bling bling’, with a golden clock that produces beautiful reflections just before sun set and majestic crown on top. A pretty well kept secret is a guided climb of the tower, only by reservation at fixed times, for a breath-taking view of the Jordaan area and the rest of the city. Right next to the Westerkerk is Anne Frank’s House. Here you can visit the place where Jewish teenage girl Anne Frank hid from the Germans and wrote her diary before she was betrayed and transported to Germany to die in Bergen-Belsen shortly before the end of WW II. This sad and impressive memorial of the Holocaust is one of Amsterdam most frequently visited sites. Make sure to buy your ticket online if you want to visit it. In the actual canal of Prinsengracht you will get to see many house boats, ranging from very luxurious and modern to some rather original but run down ones. You might be able to get a glimpse of the interiors while passing them on your boat tour. But if you want to have a proper look in a real houseboat, either rent a houseboat during for your stay or -a lot more economic- visit the houseboat museum on Prinsengracht. A boat trip on Prinsengracht used to be rather chaotic on peak days. Recently, with the introduction of one way traffic this has changed. Although still popular and very busy at times, boat traffic on Prinsengracht has become rather orderly and easy. You just go with the flow. Please make sure to include Prinsengracht in the beginning of your boat tour, from the north towards the Amstel river. Ghost riding could be painful in many ways, including a fine of euro 340,-. Three times a year chaos returns on Prinsengracht. It is the most popular and most congested canal during King’s Day (27 April), with parties everywhere, both on the shore and on boats. Prinsengracht is also the longest part of the annual canal parade during Gay Pride (first Saturday of August), attracting an enormous crowd to see the 80 large decorated party boats full of people dancing, singing and celebrating diversity, freedom and respect. And it is home to the annual Prinsengrachtconcert, when after sun set part of the Prinsengracht is turned into a large open air venue for a free classical concert in a magical atmosphere. The picture above is taken on one of the most photogenic spots of Amsterdam. Give it a try yourself! You will find these fine pieces of canal architecture right at the beginning of Prinsengracht, on the intersection with the most beautiful canal of Amsterdam. Did you pay attention? Yes indeed, on the intersection with Brouwersgracht. On the list of most popular canals without any doubt Prinsengracht would rank number 1. 99% of all Amsterdam visitors get to see Prinsengracht, one way or the other. And so should you! With its impressive length of more than 3 kilometers it cuts right through the city center. The construction of Prinsengracht started in 1612 and took almost 50 years. At the time Amsterdam became the third largest city in the world, after London and Paris. Can you imagine? Prinsengracht is still bustling with life, due to a perfect blend of different functions. Prinsengracht has it all: residential apartments, hotels, offices, shops, galleries, cafes, restaurants, churches, coffee shops, museums and so on. With the Westerkerk (church) and Anne Frank’s House it houses two true Amsterdam icons. The magnificent Westerkerk is a 17th century protestant church in renaissance style. Its tower is a true Amsterdam landmark with a lot of ‘bling bling’: a golden clock that produces beautiful reflections just before sun set and majestic crown on top. A well kept secret is a guided climb of the tower, only by reservation, for a breath-taking view. Right next to the Westerkerk is Anne Frank’s House. This sad and impressive memorial of the Holocaust is one of Amsterdam’s most frequently visited sites. Make sure to buy your ticket online if you want to visit it. Prinsengracht also has many different house boats. You might be able to get a glimpse of the interiors while passing them on your boat tour. If you want to experience a houseboat yourself, you can either rent a real houseboat or visit the houseboat museum on Prinsengracht. At peak times a boat trip on Prinsengracht used to be rather chaotic. With the introduction of one way traffic this has changed. You just go with the flow. Please don’t try ghost riding; the fine is a painful euro 340,-. Three times per year chaos returns on Prinsengracht. It is the most popular canal on King’s Day (27 April). Prinsengracht is also on the route of the annual canal parade during Gay Pride (first Saturday of August), attracting an enormous crowd to enjoy and admire the 80 large decorated party boats. And it also hosts the annual Prinsengrachtconcert, a free classical concert in a magical atmosphere. The picture above is taken on one of the most photogenic spots of Amsterdam: right at the beginning of Prinsengracht, on the intersection with Brouwersgracht. Bordering Prinsengracht at the western side is the popular Jordaan area. This densely populated area consists of a couple of dozen streets and a handful of canals. All of these look like miniature versions of the four main canals. In general the Jordaan canals are narrower, the houses along them smaller and the bridges more slender. Altogether this gives the Jordaan a very intimate and small scale atmosphere. Just like the main canals, the Jordaan has a nice mixture of residential homes, small scale offices, one of a kind shops, galleries, hotels, restaurants and cafes. Whereas in the 17th century the main canals were home to the rich and famous of the city (which has not changed since then), the Jordaan was the low cost alternative. This showed in the poor quality of the housing, which attracted many immigrants. Among them were many French protestant refugees. Some say the word Jordaan is derived from ‘jardin’, the French word for garden. That explains the many streets named after flowers. The Jordaan is the earliest example of the gentrification process that is still expanding, nowadays even in the more remote parts of Amsterdam. Ever since its development the Jordaan housed poor families with many children on a very small surface. During a large period of time the Jordaan was even considered a sort of ghetto. Only as recently as in the 1980’s and 1990’s both government, housing associations and private parties severely increased their investments in this area, and its hidden potential appeared quickly and clearly. Nowadays, the Jordaan is an extremely popular and expensive area to live in. Despite their beauty and their central location most of the time the Jordaan canals are relatively quiet. This makes them an excellent area to discover yourself on a self-driven rental boat. You can’t go wrong taking any of the Jordaan canals: Egelantiersgracht, Bloemgracht, Lauriergracht, Looiersgracht and Passeerdersgracht. Actually it is nice to take at least two: one of them from Prinsengracht to Lijnbaansgracht and another one back from Lijnbaansgracht to Prinsengracht. It is possible to incorporate this in a three hour rental. However, if you want to see more of them we recommend to rent a boat for four hours. Last but not least, there’s one question still open: what canal is the most beautiful of all Jordaan canals? I’m going for Bloemgracht (translated: Flower Canal), starting closely to the Westerkerk with an interesting mixture of large and small houses and a couple of nicely flower decorated bridges. West of Prinsengracht is the popular Jordaan area, densely populated and consisting of a couple of dozen streets and a handful of canals. In general the Jordaan canals are narrower, the houses along them smaller and the bridges more slender. This gives the Jordaan a very intimate and small scale atmosphere. Just like the main canals, it has a nice mixture of residential homes, small scale offices, one of a kind shops, galleries, hotels, restaurants and cafes. In the 17th century the Jordaan was built as a low cost alternative to the main canals, that were home to the rich and famous (which has not changed since then). Among the many immigrants that the Jordaan attracted were a lot of French protestant refugees. Some say the word Jordaan is derived from ‘jardin’, the French word for garden. That explains the many streets named after flowers. The Jordaan is an early example of gentrification. The Jordaan has always housed poor families with many children in small houses. During a large period of time the Jordaan was even considered a ghetto. However, in the 1980’s and 1990’s both government, housing associations and private parties severely increased their investments in this area. As a result the Jordaan has become an extremely popular and expensive area to live in. Nevertheless, the Jordaan canals are still relatively quiet. This makes them excellent to discover on a self-driven rental boat. You can’t go wrong taking any of the Jordaan canals: Egelantiersgracht, Bloemgracht, Lauriergracht, Looiersgracht and Passeerdersgracht. Last but not least, one question is still open: which is the most beautiful of all Jordaan canals? I’m going for Bloemgracht (‘Flower Canal’), starting closely to the Westerkerk with an interesting mixture of large and small houses and a couple of nicely flower decorated bridges. I’m sure that Entrepotdok is not on everyone’s shortlist of favourite Amsterdam canals, but it has been a personal favourite of mine since I arrived in Amsterdam in 1993. Back then it was still of the beaten track. Nowadays, that would be too much to say, but it is still not as frequently visited as many of the more centrally located canals. Some might argue that Entrepotdok lacks the variation in architecture that many other canals have, but for me this is also what makes it stand out. It’s the similarity in this long straight row of former warehouses that impresses. Presently, the spacious apartments in these buildings are highly wanted (and therefore sad enough still too expensive for me), but in the early 19th century they were built for a different purpose: storing goods from all over the world. Think of products that we still use (like wine, cocoa, grain, rye and wood), but also goods that have fortunately gone ‘out of fashion’ like whale bacon and whale tear. The name Entrepotdok still reminds of its function. Entrepot is French for a customs-controlled warehouse. The French rulers at that time decided that all imported goods had to be checked and taxed at one central storage point, before they were further distributed. So ‘merci beaucoup’ to the French for the pretty looks of this canal! The other (southern) side of the canal could not look (and smell) more different: it’s the Artis Zoo. Here you might be able to spot some wildlife (like zebras and giraffes), to add some ‘safari flavour’ to your Amsterdam canal trip. Entrepotdok is located in the eastern city center. It takes quite a long trip to get there from our boat hire in the western city center. So if you want to visit this area with your rental boat, we recommend to go for a four hour rental. I’m sure that Entrepotdok is not on everyone’s shortlist, but it has been a personal favourite of mine ever since I arrived in Amsterdam in 1993. Back then it was still of the beaten track. Nowadays, that would be too much to say, but it is still relatively quiet. Some might argue that Entrepotdok does not have a lot of architectural variety, but for me this is also what makes it stand out. It’s the similarity in this long stretch of former warehouses that impresses. Presently, the spacious apartments in these buildings are highly wanted to live in, but in the early 19th century they were built for a different purpose: storing goods from all over the world. Think of products that we still use (like wine, cocoa, grain, rye and wood), but also goods that have fortunately gone ‘out of fashion’ like whale bacon and whale tear. The name Entrepotdok still reminds of its history: Entrepot is French for a customs-controlled warehouse. The French rulers at that time decided that all imported goods had to be checked and taxed at a central storage point, before they were further distributed. So ‘merci beaucoup’ to the French for the pretty looks of this canal! The other side of the canal could not look (and smell) more different: the Artis Zoo. By spotting zebras and giraffes your Amsterdam canal trip might suddenly change into a ‘boat safari’. Entrepotdok is located in the eastern part of town. It is quite a long trip to get there from our boat hire. So if you want to visit this area, we recommend to go for a four hour rental. The Groenburgwal is a real hidden gem right in the centre of Amsterdam. It is a direct side canal of the Amstel river. It is rather short, quite narrow and the southern entrance is via a very charming but rather low wooden drawbridge. Because of these restrictions, you won’t find any large (tour) boats in this canal. Coming from the south you will get a lovely view on the canal, with the good-looking Zuiderkerk (‘southern church’) on the background as a bonus. In the old days this canal housed a lot of cloth weaving factories and the ‘groen’ (meaning ‘green’) in the name of this canal came from the presence of dye houses specialised in the colour green. At present, the colour green is still abundant: many lush trees give this canal a very green appearance and also a lot of shade. Many Amsterdam locals might also remember Groenburgwal for another reason. There used to be a well-known public health clinic for STD’s. I’m afraid the author of this article has also been here. Just once, of course. And yes, everything is fine now, thanks for asking. It is possible to incorporate Groenburgwal in a three hour boat trip from our dock. However, if you don’t want to hurry or if you wish to see some more nice canals in the area we recommend to go for a four hour boat hire. Groenburgwal is a side canal of the Amstel river and a hidden gem right in the centre of Amsterdam. It is short, narrow and the southern entrance is through a charming but low wooden drawbridge. Therefore you won’t meet any large boats in this canal. From the south you have the most lovely view with the good-looking Zuiderkerk (‘southern church’) on the background. The ‘groen’ (meaning ‘green’) in the name of this canal came from the presence of dye houses specialised in the colour green. The colour green is still very present: many lush trees give this canal a very green appearance. Amsterdam locals might also remember Groenburgwal for another reason: there used to be a well-known public health clinic for STD’s. I’m afraid the author of this article has also been here. Just once, of course. And yes, everything is fine now, thanks for asking. It is possible to include Groenburgwal in a three hour boat trip, but we recommend to go for a four hour rental if you want to see this canal and some other nice canals in this area. Herengracht is one of the four main canals in Amsterdam and considered to be the most prestigious. Top of the bill is the so called ‘Gouden Bocht’ (translated: ‘golden bend’). This is where the top class regents and rich merchants ruling the Dutch Republic in the 17th century built their impressive houses. Think of the Bill Gates and the Jeff Bezos of that era, having made their fortune in worldwide trading. Currently, the most notable regent living on Herengracht is the mayor of Amsterdam on number 502. Her name is Femke Halsema, the first ever female mayor of Amsterdam and also the first Amsterdam mayor that comes from Groen Links (the Green Party). In this particular stretch of Herengracht most plots of land -and as a result also the facades of the houses- are double the regular size. Apart from the remaining residents Herengracht has become a favoured habitat for any type of office that can afford marble staircases, decorated high ceilings and antique chandeliers. It is really easy to include Herengracht in a three or four hour boat tour from our boat hire. Unfortunately, a boat tour on Herengracht does not reveal what is -let alone what was- behind the facades of these houses. If you want to know, it’s worthwhile to check out Museum Willet-Holthuysen on Herengracht 605. It has an authentic 18th and 19th century interior and a beautiful garden. Or go to Het Grachtenhuis (translated: ‘the Canal House’) on Herengracht 386 for literally everything you might want to know (and much more) about the Amsterdam canals. There’s two other -more peculiar- museums on Herengracht worth mentioning. The first one is Tassenmuseum Hendrikje (Museum of Bags and Purses) with some 4500 items on display -including exclusive stuff by Prada, Gucci and D&G- and the possibility to enjoy a ‘high tea’. Not my cup of tea to be honest, but immensely popular with the ladies and the gay community. Of the four main canals in Amsterdam Herengracht is the most prestigious. Top of the bill is the ‘Gouden Bocht’ (‘Golden Bend’). This is where the regents and merchants ruling the Dutch Republic in the 17th century built their impressive houses. Think of the Donald Trump, Bill Gates and Jeff Bezos of that era. Currently, the most notable regent living on Herengracht 502 is Femke Halsema, the first ever female mayor of Amsterdam. It is also a favoured habitat for businesses that can afford golden name plates, marble staircases, decorated high ceilings and antique chandeliers. Unfortunately, a boat tour on Herengracht does not reveal what is -let alone what was- behind the facades of these houses. If you want to know, check out Museum Willet-Holthuysen on Herengracht 605. It has an authentic 18th and 19th century interior and a beautiful garden. Or go to Het Grachtenhuis (‘the Canal House’) on Herengracht 386 for everything you might want to know (and much more) about the Amsterdam canals. Herengracht has two other -more peculiar- museums worth mentioning. The first one is Tassenmuseum Hendrikje (Museum of Bags and Purses) with some 4500 items on display -including stuff by Prada, Gucci and D&G- and the possibility to enjoy a ‘high tea’. Not my cup of tea, but immensely popular with the ladies and the gay community. The other one is the Kattenkabinet (‘the Cat Cabinet’), a small private museum with ‘cat art’. This museum was founded by a local in remembrance of his cat named ‘John Pierpont Morgan’. Believe me, I’m not making this up..
Another perfect place for a ‘postcard picture’ of Amsterdam is the relatively narrow Reguliersgracht. Just like Brouwersgracht, this is a canal that connects the main canals. From north to south it intersects with Herengracht, Keizersgracht, Prinsengracht and Lijnbaansgracht. Unlike most Amsterdam canals Reguliersgracht follows a straight line. This allows for a unique perspective of seven similar bridges in a row. On a regular three or four hour canal tour you normally cross the Reguliersgracht twice, both on your way to the Amstel river (e.g. on Prinsengracht) and on your way back (on Keizergracht or Herengracht). It seems impossible to cross Reguliersgracht without taking a short break for a picture. The boat in front of you will definitely remind you of that. Near the intersection of Reguliersgracht and Prinsengracht is Amstelveld, a rather tranquil and spacious square that you might not expect in the middle of town. The beating heart of this area is Café Nel, a 17th century wooden church transformed into a brasserie with a large outdoor terrace, impressive trees and a playground. Another perfect place for a ‘postcard picture’ of Amsterdam is Reguliersgracht. This narrow canal connects the main canals Herengracht, Keizersgracht, Prinsengracht and also Lijnbaansgracht. Unlike most other canals Reguliersgracht follows a straight line, providing a unique perspective of seven similar bridges in a row. On a regular three or four hour canal tour you normally cross the Reguliersgracht twice, both on your way to the Amstel river (e.g. on Prinsengracht) and on your way back (on Keizergracht or Herengracht). It seems impossible to cross Reguliersgracht without taking pictures. The boat in front of you will definitely remind you. Near the intersection with Prinsengracht is Amstelveld, a tranquil and spacious square that you might not expect in the middle of town. The beating heart of this area is Café Nel, a 17th century wooden church transformed into a brasserie with a large outdoor terrace, impressive trees and a playground. Feel like exploring the most beautiful canals of Amsterdam yourself? At your own pace and from the best perspective you could think of? Then rent your own private boat at Boats4rent Boat Rental.